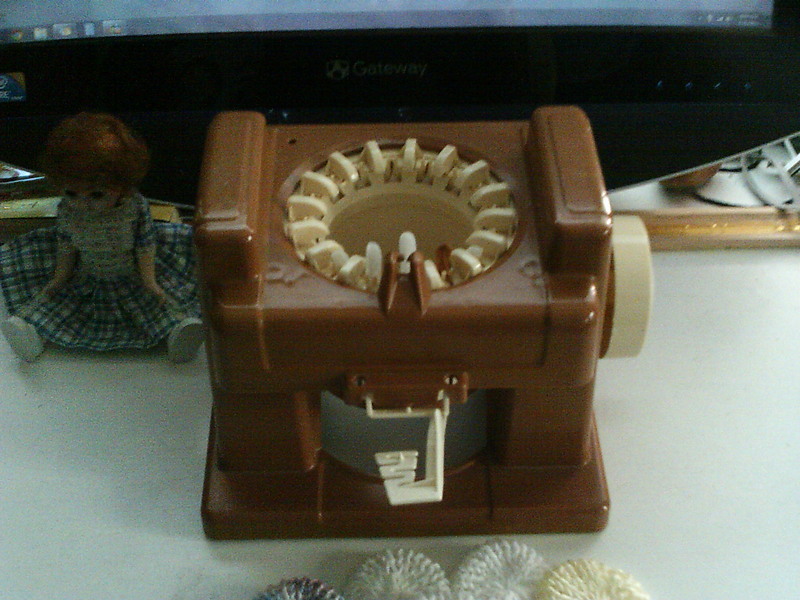 I managed to get a 1974 mattel knitting machine from ebay and it works beautifuly. My R.A. has REALLY been bothering me a lot lately and the crank knitter has not been bothering it at all. I’m one of those people who needs to constantly be doing something with my hands (I start to get stressed out if I don’t. Crafting enhances my calm.) and R.A. can slow that down quite a bit. I can see myself using this little cutie a lot. 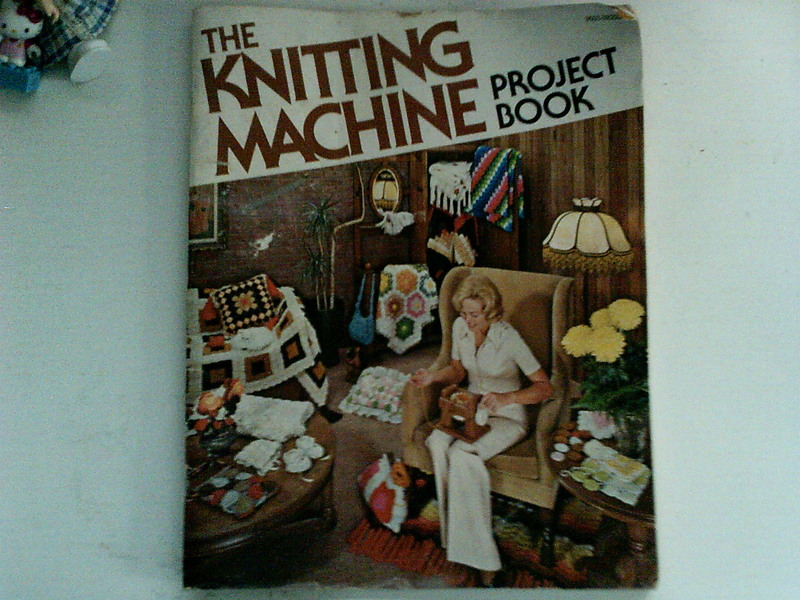 The one I bought still had the pattern book with it, so it was a really lucky find. 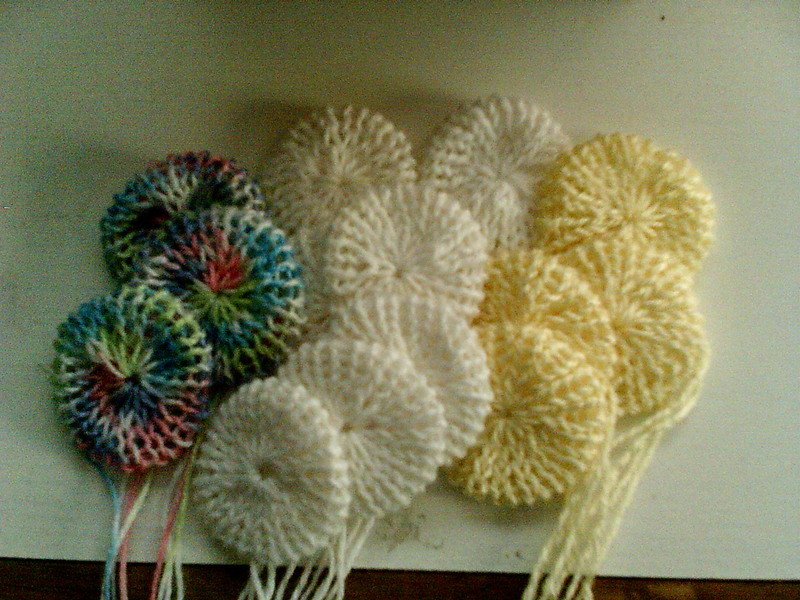 I’ve been making the “puffs” or “granny circles” that are in the book. They are supposed to be sewn together to make something larger. They are basically a knitted version of the yo yo’s that people make out of cloth. I recently sold a stuffed animal I crocheted and used the money I made from it to buy my daughter and I each a Martha Stewart Knit and Weave Loom. I’m loving all the different looms I can make with it. It feels sturdy in my hands when I use it. 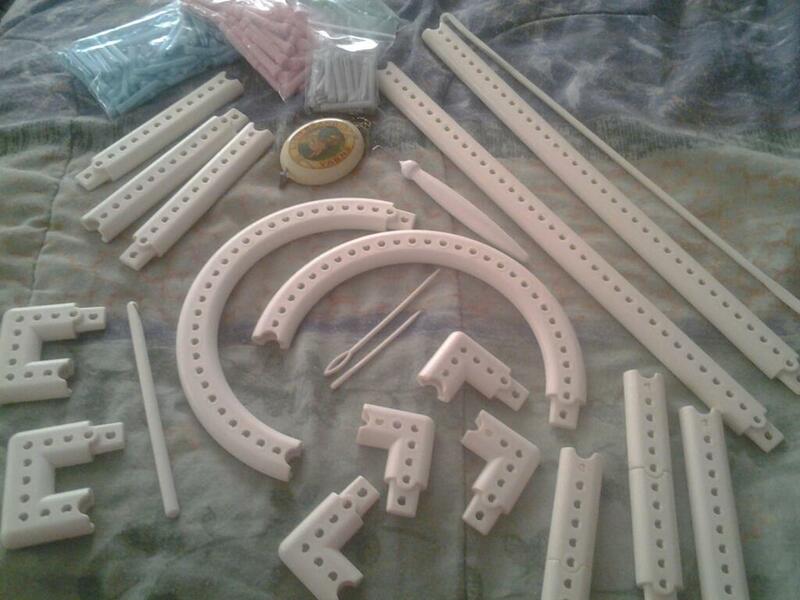 I also really like that I can use large gauge or small gauge pegs. I always hated the fact that I couldn’t use a single strand of worsted weight yarn with my Knifty Knitters. I CAN do that with the Martha Stewart loom. So far the only thing I’ve found about this loom that is a bit bothersome is that when I’m using my small gauge pegs some of them want to wiggle loose. On the up side though I figured out a little trick to help with that. At the bottom of the peg. The end that inserts into the loom… the pegs have a gap in the center… If I use something (coin or back side of a butter knife) to widen the gap a little on the ones that are doing that, it has been taking care of the problem. Other than that, it’s been a nice loom to use and I’ve really been enjoying it. When I was untangling all the yarn the other day, I came across a loom knit sock I was working on for one of my sons. I had completely forgotten about it. I was glad to find it though, because my husbands afghan has gotten so large it’s not very good for travel yarn play. A sock on the other hand, that’s perfect for travel. I was making the sock on an adult sock loom, the one I always make mine and my daughters loom knit socks on. Normally I do an e-wrap to do my knit stitches(nice and strechy), but when you use the e-wrap the stitches slowly spiral, so to get the heal and toe to line up properly you have to offset the first few stitches of the toe. I thought this time I would use the flat stitch instead, because with the flat stitch off setting the toe is not necessary, everything lines up as it should, BUT… With the flat stitch, the stitch tends to be tighter. That made the sock I was working on MUCH too small. (I had to frog it. Rip-it, Rip-it) I guess if I want to use the flat stitch I’ll have to use a larger size loom. I had my birthday on the 6th and I received some birthday money. Now normally what I’m supposed to do with birthday money is to get something fun for me, because anytime I’ve ever done anything responsible with it, it will aggravate who ever gave me the money. (same thing for mothers day) So because of that, birthday money and mothers day money is usually when I buy nice crafty stuff for me that I normally wouldn’t. That’s how I got my Options knitting needles and my sock looms. I’ve been thinking about what I would like to get, and I think I’ve decided on a knitting board. I love my sock looms, but they are small and I’m limited on the size projects I can do on them. Plus my sweety pie really wants me to knit him a blanket and a knitting board would be a fun way to make it. I was thinking I wanted to make his blanket double knit, so it will be thick and warm and both sides will look nice instead of having a right side and a wrong side, and a knitting board is a nice way to make double knit fabric. I joined a yahoo loom knitted sock group, and a lady there makes toe up socks on her loom. I didn’t even know you could make toe up socks on a loom, but once I started thinking about it, I could see how it could be done. So I decided to give it a try. I went ahead and froged the sock I was working on before. I had messed up on the heel because of being distracted by the phone, so I was going to have to frog that part anyway. I’ve finished the toe part and have moved on to the foot. I think I like doing socks this way, because I wont have to do any sewing on them. When I make cuff down socks, I always have to sew the toe closed. Here’s some pictures of what I have done so far. For the socks I’m working on right now, I decided I wanted to make alternating strips of a variegated yarn that has purple, green and yellow. The other yarn I’m using is just a solid yellow. So far, I haven’t even gotten two compleat strips done and the two yarns keep twisting with each other. I need to stop every so often to untwist them. It really makes me wonder how people who knit with several different colors and yarns at once, keep the yarn from being a mass of knots. I’ve heard of people who do that fair isle knitting (I think that’s what it’s called) who alternate between 4 or 5 different colors. I do remember someone telling me that there mother used to use yarn bobbins, so maybe that’s how they do it. If I have too much trouble with this sock, maybe I’ll try that on the next one. I’ve started another sock, to keep myself occupied until my knitting needles get here. So far, the apoxie I used seams to be holding the pegs in place. Hopefully none of the other pegs try to come out. That apoxie is such messie stuff to have to deal with.